Louise Linton, the angular wife of Treasury Secretary Steve Mnuchin best known for sinisterly clutching a fistful of dollar bills and a reliance on government-funded private air travel, was once on an apology tour, during which she gave several contrite interviews to outlets like Elle and Washington Life. That apology tour is over, according to a profile published Monday in the Washingtonian, and she doesn’t know why people got so worked up to begin with. In the profile, she says she knows she was a “bozo” for the Instagram—you know, the #rolandmouret #hermesscarf Instagram—but she doesn’t know why people freaked out over that leather-gloves-I-control-the-means-of-production picture. 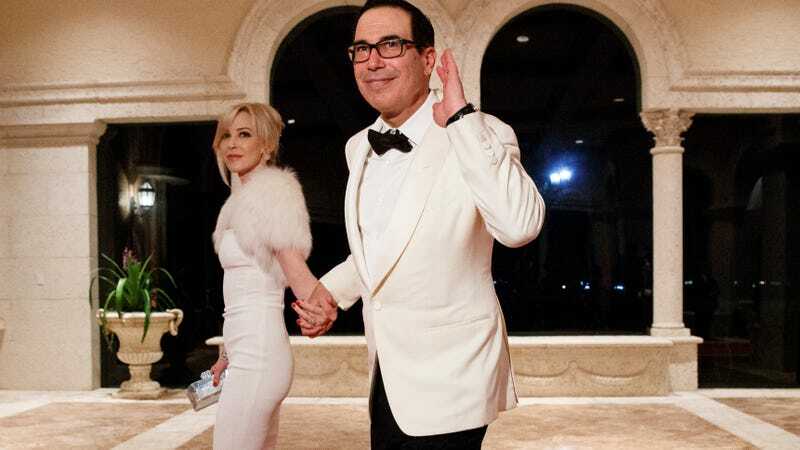 She watched as multiple photographers snapped pictures of Mnuchin holding a sheet of $1 bills, then heard him say, “Honey, come in the picture.” So it was spontaneous, she says. She placed one gloved hand over the money, and the camera shutters took off. “Then, naturally, they”—that is, the media, with their penchant for “controversy” and “meanness” and “vitriol”—“didn’t use any photo once my face was natural and settled. They deliberately selected a photo where I was still stepping into the picture, and it made me look like, ‘Mwahaha,’ like the cat that got the cream.” Indeed, Linton’s lips were pursed, eyes narrowed, affect self-satisfied, as though never in her life had the woman who grew up in a Scottish castle and married a man worth $350 million clutched something so precious. Other than that, nothing we learn is particularly unexpected, like how Linton sits “sidebar” at SoulCycle—meaning in the front row, a space reserved for the best and most devoted SoulCyclers.